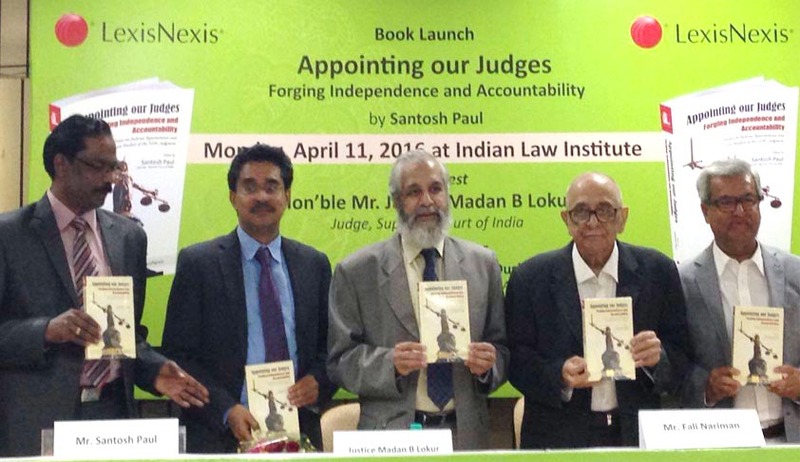 Advocate and author, Santosh Paul’s edited volume, ‘Appointing our Judges: Forging Independence and Accountability’, published by LexisNexis, was released by Justice Madan B Lokur at a well-attended function at Indian Law Institute, New Delhi on 11 April. Apart from Justice Lokur, other dignitaries who attended the function include Justices Kurian Joseph, and Gopal Gowda, Fali Nariman, Dushyant Dave, TR Andhyarujina, and Dr.S.Sivakumar, Professor, Indian Law Institute. While none of the Judges including Justice Lokur, who presided over the function, chose to speak on the occasion, other speakers gave vent to their disappointment with reports appearing in the media about growing divide between the Supreme Court’s collegium and the Government over the appointment of Judges. Nariman began saying that the Government and the collegium don’t see eye to eye, and this is not surprising. Governments, he said, are always apprehensive about the independence of Judges. Quoting from a letter written to him by a Judge of the Supreme Court of Natal, during the apartheid regime, he said, politicians, who pay lip service to independence of judiciary, prefer to have executive-minded lackeys. Nariman then explained the background to Paul’s new book’s dedication to Dorab Patel, Pakistani jurist and law maker, who lived till 1997. Patel, a Parsi Judge, was among the minority of Judges, who had dissented in the landmark case of Pakistan Supreme Court upholding the death penalty for the former Pakistan Prime Minister, ZA Bhutto in February 1979.. The Lahore high court had confirmed the death sentence for Bhutto. Initially, five of the nine judges of Pakistan Supreme Court were willing to overrule Lahore high court. But then, Nariman recalled Bhutto’s counsel in the Supreme Court went on arguing for long before the bench, and he quipped, it was a reason why long arguments bring the opposite result: two of the nine Judges had to retire during the hearing, and the strength of the bench was reduced to seven. Nariman recalled that initially only three out of nine Judges were in favour of hanging Bhutto. With two anti-hanging Judges retiring in the midst of hearing, and with the Chief Justice tilting with the three Judges who voted for hanging Bhutto, the result was sealed. In 1981, Dorab Patel resigned from the Supreme Court, because he refused to take the new oath by the Chief Martial Law Administrator, Zia Ul Haq. Surprisingly, Zia invited Patel for a dinner at his home on the same day when he had submitted his resignation. Recalling his conversation with Patel on that episode, Nariman said Patel was very apprehensive, yet he went for the dinner, and returned home safely. Patel had told Nariman that Zia did not touch the subject of his resignation even once, and was a gracious host. Since then, till his demise, Patel was never critical of Zia personally, although he was critical of the military rule, Nariman recalled. Supreme Court Bar Association president and senior advocate, Dushyant Dave, was a votary of National Judicial Appointments Commission (NJAC), during the hearing of the petitions against it in the Supreme Court. Therefore, it came as a big surprise, when he was critical of the Government in its ongoing tussle with the Collegium. He deplored the fact that the recent transfers of Judges were not transparent. He also regretted that the Collegium’s consultations with the senior members of the bar were also not transparent. ‘There is need for a system or mechanism to facilitate such consultations by the Collegium’, he said. Saying that there is a serious fight going on over the Memorandum of Procedure (MoP) for appointing Judges of the higher judiciary, Dave asked who is the Government to decide that national security consideration (as reported in the newspapers) must prevail in the selection of Judges. Whatever the result of the NJAC case in the Supreme Court, the Constitution bench which heard the matter should not have left the responsibility of drafting the new MoP to the Government, he said, knowing fully well that two of the Judges on the bench, were present at the function. Senior advocate, TR Andhyarujina was a known critic of the collegium system, and the system of Judges appointing themselves. He was critical of the NJAC judgment, because, he said, it went against the world-wide trend which is in favour of a Judges Appointments Commission to choose Judges. He asked how the system of Judges appointing themselves could be considered as part of the basic structure doctrine (BSD). He recalled that in Pakistan, simultaneously when the NJAC bench was hearing the matter last year, 17 Judges sat to decide the constitutional validity of the National Judicial Commission (NJC) in Pakistan. The majority of Judges, he said, did not subscribe to the BSD, and upheld the NJC. And, as he mentioned, they did so, citing his recent book on Keshavananda Bharati’s case. Andhyarujina asked with the revival of the collegium, whether things have improved. Today, there are five vacancies in the Supreme Court, he said. ‘What are we doing? There is no indication when the vacancies will be filled. How long we can go on like this. There is total impasse. It is a self-inflicted wound’, he said, keeping in mind that his strong words are likely to hurt two of the Judges who revived the Collegium system, as part of the NJAC bench, and who were present at the function. Author and editor of the book released at the function, Santosh Paul, had argued against the NJAC, during the hearing of the case in the Supreme Court, on the ground that it violates independence of the Judiciary. Explaining why he is citing the sordid saga of judiciary abdicating to the Government in Pakistan, Paul said in 1958, Pakistan Supreme Court compromised , and damaged democracy for all time to come. ‘It is not a matter of Constitutional experiment, It is a failed state’, he said. Paul paid rich tributes to former American Supreme Court justice, William O Douglas, calling him the most glorious American Supreme Court Judge. Despite two failed attempts to impeach him, Justice Douglas proved to be the best libertarian Judge in the American Supreme Court, he said. Paul traced the source of the collegium system to Grammar of Politics, written by Harold Laski in 1967. Laski, he said, was critical of the executive appointing Judges. Paul also mentioned constitutional scholar, Laurence Tribe’s debunking of the ‘myth of the surprised President’. Tribe used this expression to make his point that Judges have been loyal to the ideals and perspectives of those Presidents who have nominated them, despite the guarantee of lifelong tenure in the American Supreme Court. The function came to a close with senior advocate, Indira Jaising asking a question whether Judges were expected to say Bharat Mata Ki Jai, and whether the NJAC judgment will be remembered as a tyranny of the unelected or the Court’s undoing the will of the people. With Justices Lokur, Joseph and Gowda leaving the function while Jaising posed her question, Paul answered it saying if Government’s arguments like the ones Jaising had posed as questions are accepted, the Supreme Court’s judgment in Keshavananda Bharati case would no longer be a good law. Paul said he was critical of the Keshavananda Bharati judgement when it was delivered, but later changed his view, when he realised that it was due to this, that Indian democracy could survive, despite challenges to it.